Sonos wireless sound systems are the gold standard for people looking for effortless music streaming around the house, but you'll pay for quality and convenience. If you've been looking to make the investment, Sonos is offering a bundle that'll save you a few bucks. If you're not familiar with why you'd want a Sonos over, say, an Airplay or Bluetooth speaker, first read Brian Lam's Lifechanger piece. Magic is a singing home. If you know you want a Sonos, here's what this deal offers: For $300 you get a Sonos Play:3, a Sonos Bridge, and 90 days of Rhapsody. The Sonos Play:3 is the entry-level Sonos speaker—it's wireless and tiny, and if you get two of them, they can function as wireless stereo speakers. 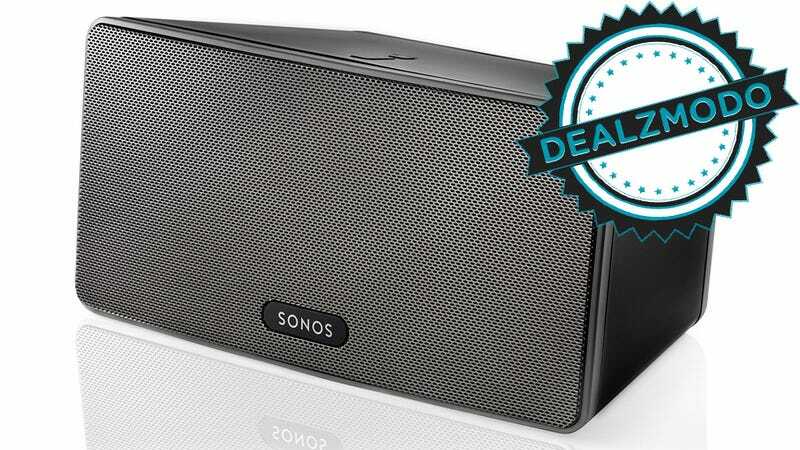 It's usually $300—which is the price of this deal—but Amazon and Sonos are also throwing in a free Sonos Bridge and three months of Rhapsody. The bridge hooks up to your router and extends your Sonos network—it's certainly something you'll want if you're piecing together a whole Sonos system. And while Rhapsody isn't one of our favorite music streaming services, free is free. Special thanks to Shane Roberts from the Moneysaver covering for me last week—definitely check 'em out if you want more Steam games in your queue you'll never play.